Stocks gave back a large part of their gains from January. The S&P 500 ended February down 3.7% after briefly pulling back 10% from the highs reached in January. Interest rates increased for the sixth straight month, with the yield on the 10-year Treasury finishing at 2.87%, the highest since 2013. For the year, stocks show small gains despite the pullback. Emerging markets continue to lead the developed world, gaining 3.3%. 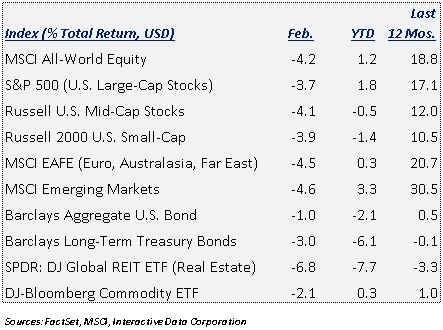 Across the major asset classes, nothing worked in February. Stocks, bonds and commodities all posted negative returns. Since 1978, this has only happened 33 months out of 470, or about 7% of the time. A double whammy from higher interest rates, which increases the required return, and higher volatility, which reflects greater uncertainty about future returns, contributed to lower prices across the board. It seems disingenuous to claim that the return of volatility is a good thing. After all, volatility usually accompanies falling stock prices. But it serves as a reminder that stocks do not always go up in a straight line and bond yields do not always fall. The sudden change in direction also tends to shake out the weak hands, whose exit from the market provides opportunities for those with a longer-term view. Since the US election, investors have worried that some of Trump’s policy initiatives could threaten confidence in the global economy. The markets breathed a sigh of relief last year as the administration largely steered away from the most controversial economic policies. That honeymoon with the markets may be ending. The recent tax reform and proposed budget could push the annual deficit to over $1 trillion by 2019. Running an expansionary fiscal policy is typically not part of the playbook for a late cycle economic policy. Adding tariffs and a potential trade war substantially increases risks to the economy. Raising the cost of steel and aluminum harms industries higher up the value-add chain, potentially threatening more jobs than the policy is trying to protect. It also risks retaliatory tariffs on US exports from other nations, many of whom are our political and economic allies. Despite the President’s rhetoric, history has proven that trade wars are not easy to win. There is a more sanguine view which predicts a tamer reaction by Canada and Europe, two of the biggest exporters of steel and aluminum to the US. In that scenario, our allies temper their response in hopes of limiting retaliation and an all-out trade battle. What about portfolio positioning in a world of tariffs and trade wars? Combined with the above-mentioned tax cut, tariffs could increase inflation pressures, something we anticipate and have already incorporated into our investment strategy. For bonds, that means lower than normal duration and Treasury Inflation Protected Securities (TIPS), in which the principal adjusts for inflation. Trade issues could also impact U.S. equities negatively relative to the rest of the world. Prior to 2017, US stocks outperformed European and Asian stocks and now carry higher valuations. We currently target 25% in foreign stocks and continue to evaluate opportunities to increase our position based on relative valuation levels. An escalation in US initiated trade concerns would point us more decisively in that direction. While the broad stock markets recouped nearly half of the losses from early this month, a few esoteric investment products were not so fortunate. The spike in volatility in early February resulted in the liquidation of a popular exchange-traded “short volatility” product known largely by its ticker symbol, XIV. Selling volatility has its merits when properly employed but can incur large losses in certain periods. XIV sold futures contracts on the VIX index, making money when volatility remained subdued. From its launch in 2010, a $100 investment in XIV would have turned into over $1,035 on February 5th. But on February 6th, that $1,035 fell to $77 as trading was halted and the fund was eventually liquidated. Just about anything can be packaged and sold in an exchange-traded product. ETFs range from those that hold traditional assets like large US company stocks to alternative ETFs that offer exposure to markets previously only available to the most sophisticated investors. The challenge is to identify what makes sense for your portfolio. It is important to understand what is under the hood. LJM Partner’s conservative sounding “Preservation & Growth” fund fell 80% overnight on February 6, begging the question of what exactly LJM was hoping to preserve. The fund was actually engaged in a similar strategy to XIV. Even a high-risk product like XIV can be useful if properly managed. An investor who bought XIV at inception and regularly rebalanced the position, essentially harvesting gains and controlling the risk, would have had a different experience than the buy and hold investor. In fact, adding 5% of XIV to a portfolio invested in the S&P 500, rebalanced annually, would have added over 1.5% per year to the performance despite the fund’s eventual demise. Managing an investment portfolio requires careful evaluation of many possible risks. An effectively diversified portfolio holds different exposures, or investment assets, to prepare for a number of different risk scenarios. Any one company has some small chance of going out of business, but the chance of a group of stocks all suffering the same fate is much smaller. XIV’s short life is a reminder that the worst case should never be disregarded as impossible, and active diversification and risk management is always important, even for seemingly safe sounding investments. Maintaining balance in your portfolio is always important. While the economy is still on strong footing, uncertainty and fear of the next phase of fiscal and trade policy could have an adverse impact on investors' willingness to own stocks. While no one can predict the future, now is not the time to be caught taking unnecessary risks.